The Coolpix S800c from Nikon will be the first camera running the Android operating system from Google (release by late September 2012). This compact camera, running under Android Gingerbread (2.3), incorporates a CMOS sensor of 16 megapixels, a 3.5-inch touchscreen, 10x optical zoom and GPS. It has Wi-Fi to download apps from Google Play, whether software for image processing or games. It also allows you to upload photos and videos on social networks. The Coolpix S800c sports vibration reduction and motion detection features. It offers several shooting modes including panoramic and burst modes (up to 8 frames per second) and it can record movies in Full HD (1080p) with stereo sound. 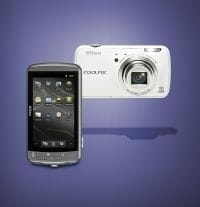 The Coolpix S8000c will be available from September 27 for a pricetag of € 379. Published by jak58. Latest update on August 22, 2012 at 09:05 AM by jak58. This document, titled "Nikon launches the first camera running Android OS," is available under the Creative Commons license. Any copy, reuse, or modification of the content should be sufficiently credited to CCM (https://ccm.net/).